My hairdresser said to me tonight, “The word ‘old’ is NOT in your vocabulary!” I love her! I forgot to tell you about the medal my cousin gave me last week. 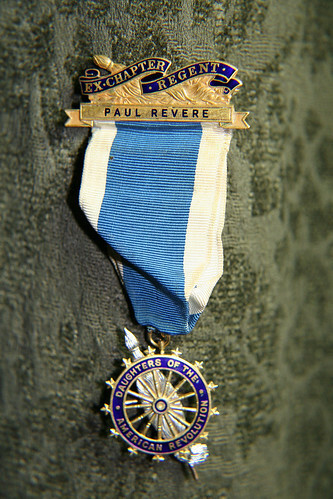 It belonged to my Grandmother and identified her as a Regent in the Paul Revere Chapter of the DAR. I asked my aunt, “What’s a regent?” and her answer was “One of the big bosses.” The medal has her name and regent number engraved on it…pretty cool, and a gift I’ll treasure, for sure! Cousin Monique? Was your grandmother in the DAR? Wow, very cool. Nice picture too! Not that you asked, but two of my great-grandmothers were. We’re old NE on my mother’s side. My mom was a regent here in Tn..She was so prould of it and so were her sisters….With seven kids, I have no idea who has the medal if there was one…..
my grandmother’s sister did all the work to get herself into the Mayflower Society but never shared. so for all i know she also did the work for the DAR. that’s one thing i’d like to do (i’ve said this for years now) for my grandmother before she passes – get all the paperwork in order so she can get the recognition she deserves as an old Yank. what a great honor to discover. Oh I can just see you all dressed up in an old lady dress, shoes and wearing the military type while gloves! Hoo-haaa!! I am so glad you like it. I found it in my closet with some other stuff of mine and remembered Tilly gave it to me thinking I might get into the DAR. I just never did, but held onto it and forgot I had it. I really felt that you would treasure it! That’s a good picture of it too, so clear. Love Ya! That’s really cool in and of itself, made more so by the family connection! Your family has such an amazing history. WOW! That’s a lovely piece of heritage and yes, I bet you will treasure it sweetie! Does that make me on the other side of the line, being a brit and all? That is very cool! I wish there were pieces of history in my family but my parents always thought of that stuff as junk and threw it all away! That’s really cool! I love family heirloom stuff like that. I know this has nothing to do with your current post, sorry. I will go back and read your work, I’m interested in that too.